Anointing Charlie Crist, Dismissing Marco Rubio, Republicans Unite…or not. by Maggie • May 13, 2009 • Comments Off on Anointing Charlie Crist, Dismissing Marco Rubio, Republicans Unite…or not. Republicans are meeting in a “special” session next week to officially brand the Democrat party as the “Democrat Socialist Party.” I think that name is apt, but really, this is a lame attempt to get a message across. Is this how Republicans unite? See photos and a video below. During the campaign we couldn’t get a Republican to stand up and call Obama a Socialist. We knew he was a Socialist, with communist leanings if given a chance. We read, we studied his background, we studied his activities as a “community organizer.” So what did our “speakers” do, they waited, now it’s too late, and their pathetic impotent whines ring hollow. Apparently, this “special” session is considered an emergency, and to call a “special” session, 16 RNC members from 16 different states are needed to call the meeting. Party leaders want to get some issues on the table for airing. I’m up for that. Two other resolutions — to urge Republican lawmakers to reject earmarks and to commend them for opposing “bailouts and reckless spending bills” — are also on the agenda, but language that would have denounced Sen. Arlen Specter, a Republican turned Democrat, and Republican Sens. Olympia Snowe and Susan Collins for voting for President Obama’s stimulus package has been dropped. I think all the “togetherness” the party leaders can stand is a very good thing, and ongoing discussions about earmarks are critical. It’s good to keep the party centered and focused. I don’t know about condemnation of Specter, Snowe and Collins. I see no fruit coming that. Maybe just doing a little strong-arm technique works better, like NEVER, NEVER support a single Bill they want supported unless it is a thoroughly conservative venture? If a Snowe or Collins Bill has the stench of Democrat support, look at it closely, very closely – and for heavens sake – read every word those two women write. You could also sit at another lunch table. Our focus must be on finding very conservative candidates for the 2010 election, and guaranteeing that powerful Republicans unite behind them with vigor. In this arena, we are going to lose our first battle: Governor Charlie Crist has announced for the U.S. Senate seat of Mel Martinez. If what I read is true, Marco Rubio is a “real” conservative out of Florida, and he’s running against Crist. Unless the information out there can be proven incorrect, Rubio is very conservative – but yet, the Republican establishment is gearing up to support Charlie Crist who rushed with adoration and open arms to support Barack Obama’s stimulus bill. Jon Cornyn says the National Republican Senatorial Committee will throw their full support behind Crist. Senate Minority Leader Mitch McConnell is backing Crist. The position is that Crist offers the best chance to “maintain the checks and balances that Floridians deserve in the U.S. Senate. What does that mean? Florida doesn’t want conservatism representing them? Gov. Crist is exactly what we need because if we don’t increase the size of our tent, we’re going to be in big trouble in our future,” said Joe Gruters, chairman of the Sarasota Republican Party and Buchanan’s political director. But big tents need strong poles, and the strongest pole of our party — the organizing principle and the crucial alternative to the Democrats — must be freedom. The federal government is too big, takes too much of our money, and makes too many of our decisions. If Republicans can’t agree on that, elections are the least of our problems. I can agree with that…but people who want to be free and people who want to smaller government should already be in our tent. Our tent is already huge, but our leaders are ignoring our presence and they are not listening to us. I say, lose the Big Tent image. Get behind conservative candidates. I don’t know that my governor [Crist] understands all the details in this package — that there will be nothing here to help with Florida’s housing economy, Martinez said, noting the package is light on stemming the tide of foreclosures. Crist acknowledged that he hasn’t seen all the details but said Florida needs federal help, period. We’re going to spend $30 to $40 million to get a Republican elected to that Senate seat, and we could end up with a guy who’s going to be the 60th vote for Democrats. Come on Republicans. 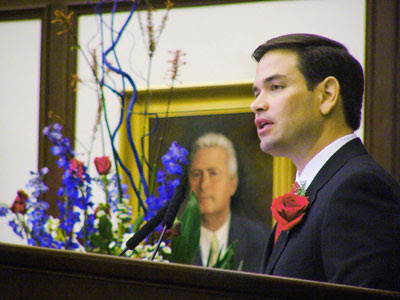 Get a mad-on and demand that those with the purse strings, those purses you’ve helped fill, take a look at Marco Rubio, at least (read more about him here) – or perhaps there’s someone else – just don’t anoint Crist because he seems the natural successor. ← Return Gilad Schalit Home NOW!